“At the highest level, digital journalism education teaches the skills of effective citizenship in the digital age,” says Pam Moore, founder of the Newton Street Study Group. 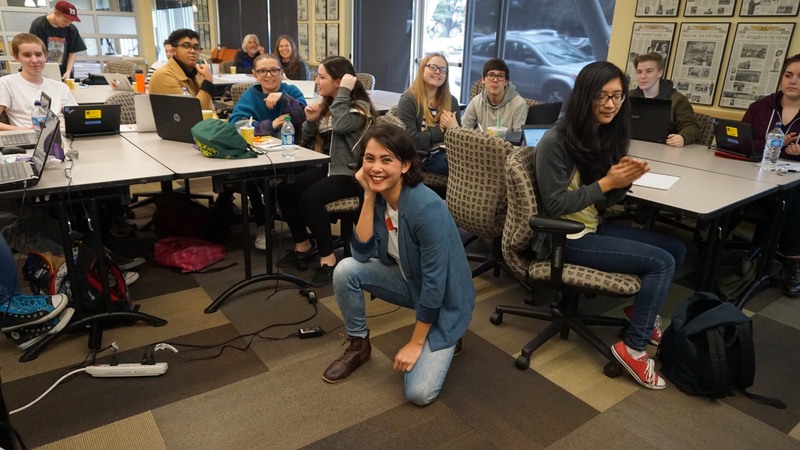 Earlier this month, Pam and her Newton Street partner-in-crime Fritz Engebretsen hosted a group of inquisitive high school journalists at the offices of the Seattle Times. The theme of the day: data journalism. The Newton Street Study Group has had some success getting high school journalists interested in data, most notably at Mountlake Terrace High School just outside of Seattle. “It’s been great creating data stories for our paper and pushing out different kinds of content. And it’s really cool knowing that this is a skill people in journalism really want, and we can start learning it right now through programs like this,” one Mountlake Terrace student said. 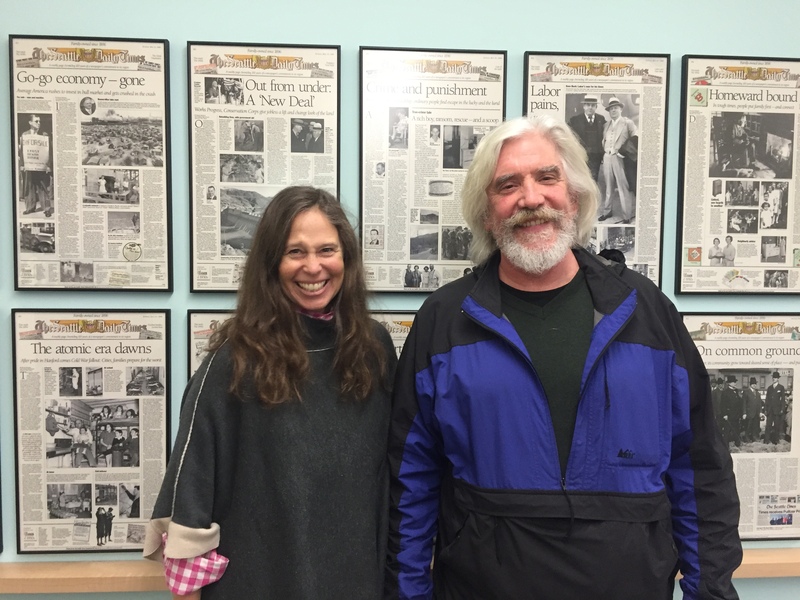 Pamela Moore and Fritz Engebretsen of The Newton Street Study Group pose for a photo. 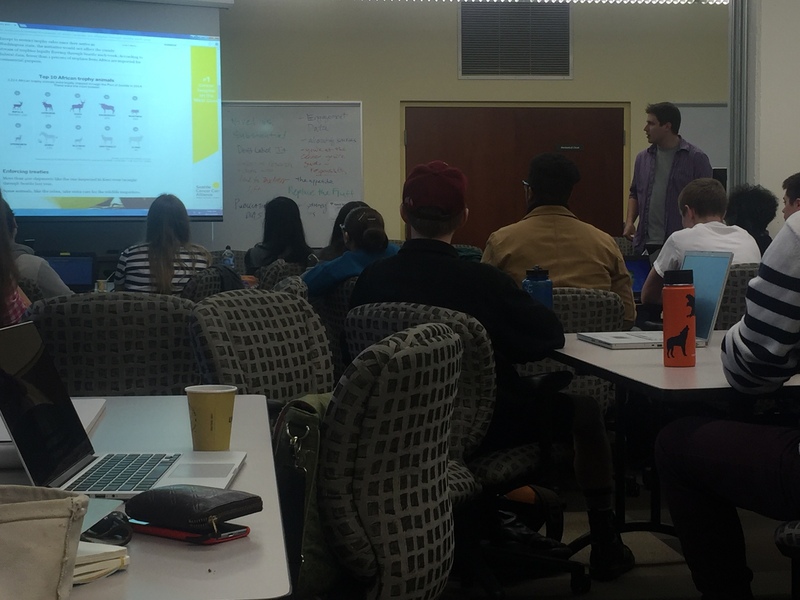 Students learned about the high demand for data skills in the newsroom from Thomas Wilburn, data journalist and newsroom web developer for the Seattle Times. Thomas recounted his journey into the world of data journalism which involved teaching himself coding skills “whenever a project called for it.” Thomas taught himself many of the programming languages needed to create news graphics. He also taught himself how to use other technologies like AUTOCAD tools which helped him create the Times' map of the Chambers Bay Golf Course. Thomas Wilburn shows the students a data project done for the Seattle Times. Thomas' work and words left the group feeling inspired to learn more data skills. Next on the agenda was a demo of Tableau Public. Together, the group explored data on Washington state high schools, comparing graduation and drop-out rates by districts, counties, and community types. The students took no time in seeing the power of not only visualizing and publishing their data, but also finding the story itself in Tableau. And the demo quickly turned into a discussion of how to get their schools' reporters to use Tableau Public. Mountlake Terrace students also shared the lessons they've learned from telling data-driven stories. “We had a huge success by creating a survey to send out about religious beliefs of our student body and visualizing the results,” a student shared. The students agreed that finding data that was interesting and relevant to a high school audience was often a challenge. They also agreed using surveys to create the data was a smart workaround. Others chimed in with ideas about visualizing sports scores and stats, looking at demographics of schools, and finding pop-culture data on topics like music and movies that interest teens. Tableau Public's Jewel Loree poses with the young journalists.